Lsbet is primarily known as a major sports betting site. However, the sports-focused website also hosts a very neat online casino with some of the most sought-after table games, card games & slots. There is no reason why that particular section of the website should ever be skipped. It is worthwhile to see what the casino has in store in the promotions & gaming department. A first encounter with the website demonstrates that the staff is committed to the highest standards when it comes to web design. The main page looks nice and informative! The promotions section features offers various deals, including sports betting. It's unfortunate that the deals have not been clearly separated for the purpose of clear delineation. That said, it is still possible to identify whether the deals belong to one section or another. The initial deal, a welcome bonus, is associated with opening an account at the casino. It is a 50% first deposit Lsbet Casino bonus deal offer. Cashback bonuses are also provided by the casino. For example, a 10% cash back deal up to €50 is given out on a weekly basis. Other exciting promotions can also be located on the website. It's good to check back with the venue in order to get updates concerning the latest offers. 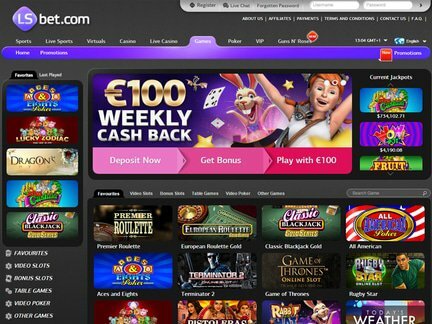 There is a myriad of payment options for people who would like to make a deposit at Lsbet Casino. The acceptable credit cards/services would include; Mastercard, Visa, Skrill, Moneybookers, Neteller, Eco Card, etc. All the games on the website are powered by quality software providers. It is possible to play famous NetEnt and Microgaming titles at the casino. In order to access the games, it is required to register by completing a brief registration form. Some visitors will not have access to real money games. The residents of the following countries are excluded from opening an account; United Kingdom, Bulgaria, Denmark, France, Iran, Israel, The Republic of Moldova, France, Netherlands and the United States of America. The website supports many different languages including; English, German, Italian, Polish, Portugese, Russian, Spanish, Greek and Turkish. Based on the language support alone, it is easy to see that the casino aims to have global reach. The popular Lsbet Casino games can be found in the favorites" category. They would include; Guns N' Roses, Hook's Heroes, Koi Princess, Roulette Professional Series, Fruit Shop Christmas Edition, Blackjack Professional Series, Starburst, EggOMatic, Go Bananas!, Cosmic Fortune, Quest for Immortality, Dazzle Me, Blackjack Classic Series, Reel Rush, Tornado Farm Escape, Spinata Grande, The Invisible Man, King of Slots, Sparks, Jack and the Beanstalk, Flowers Christmas Edition, Neon Staxx, Devil's Delight, Blood Suckers, Stickers, South Park Reel Chaos, All American, and a few other games. The website offers Table Games, Jackpot Slots, Video Poker, Video Slots and Other Games. Account problems have been reported in the past. There have also been issues with misleading free spin advertisements. Other than that, the casino has actually been climbing in the player's own casino rankings. At this point in time, it has a fairly good reputation when compared to other online casinos. A lot of the past complaints have been fully resolved. Any other issues can be reported to the staff via e-mail and live chat. A Curacao e-Gaming license was gained by Media Entertainment LV, the owner of the venue. Although the online casinos are audited by Curacao authorities, the licensing process is not known for particular rigor. Hence, the value of the license is diminished. At the same time, the legal authority to run a casino has clearly been established. I am now convinced that the sports betting site is also a good host for online casino games. The huge variety of games make the stay exciting! I was particularly drawn to the table games on the website! These games are launched with the support of the best-rated casino software. Furthermore, the website hosts many exciting promotional deals. I simply loved the first deposit offer! To conclude, I could easily provide an endorsement for the casino.